How many times have you heard someone say, ‘I know I should exercise, but I’m too busy’? Or too tired or too out of shape or too old. Fill in the blank – you’ve probably heard it all. Use our 10,000 Steps materials to teach that regular physical activity is not only good for our health, but it’s attainable for everyone! 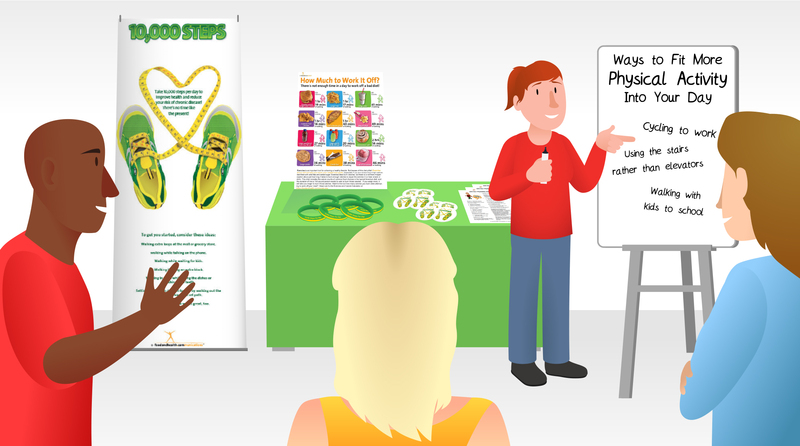 Our 10,000 Steps poster and banners are educational, fun, and eye-catching. They come with a free Take Steps to Good Health printable handout. Add some fun to your classes and health fairs by offering prizes (like our stickers, wristbands, buttons, and bookmarks) for answering questions and sharing experiences. How many steps do you think most people take every day? Help the class along by asking people to raise their hand if they think it’s 1,000-2,000; 3,000-4,000; etc. Whoever answers correctly (3,000-4,000) gets a prize (sticker, bookmark, button, or wristband). Do you use a pedometer or cell phone to count your steps? (Give these people a prize.) If so, how many steps do you usually take in a day? Do you keep track of the daily number? Tip: write down your daily steps (or use an app). You can’t change what you don’t track! Getting to 10,000 steps a day isn’t as hard as you think. Think about times when could walk instead of sitting (waiting rooms, waiting for a friend, waiting for a movie to start…). Can you think of other times when walking just a little bit more would be easy to do? How about taking an extra lap around the grocery store or mall? Walk around your office or house when talking on the phone. Every step counts! Walking is the perfect way to be active. It’s economical – no gym membership or special equipment required. It doesn’t depend on the weather – when it’s rainy, cold, or hot and humid, walk inside at the mall or around a mega-store. It can be done anytime – while talking on the phone, listening to music or podcasts, or chatting with a friend in person. Brainstorm how to take extra steps at home and as a family. How about walking after dinner, marching in place during commercial breaks, or walking up and down the stairs a few extra times a day? Brainstorm ways to take extra steps at work. Turn work breaks into walk breaks. Go by yourself or with a co-worker. Inside or outside. Hold “walking” meetings. Taking 10,000 steps daily provides the health benefits of regular physical activity, like better sleep, mood, and strength; helping you maintain or get to a healthy weight; and reducing your risk of heart disease, stroke, high blood pressure, and diabetes. Check out all the items in our 10,000 Steps theme! Do you keep your holiday celebrations good for your health? Find out with this brand-new quiz! 1. What is the most featured item in the display of foods at your holiday party? 2. True or false? I make sure to get at least some physical activity during most days of the week. a) Making a healthy plate. c) Being aware of the calorie content of the foods you purchase. 4. True or false? I make sure to eat a healthful high-fiber breakfast every morning. 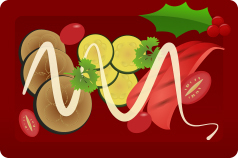 For the most healthful holiday celebration, make fruits and vegetables the start of any buffet you set up. You can keep things simple with crudités and some yogurt-based dips, or you can get fancy and roast up your favorite vegetables and serve them on a platter, drizzled with a little bit of sauce and garnished with parsley. Add bowls of berries and sliced fruit too! If you’re having a holiday gathering at a restaurant or coffee shop, check out any nutrition information that’s available online. Make sure that the portion size of what you want to order is reasonable. If it’s not, look for alternatives. Then, if you want to get or make something that only comes in a large portion, share it with a friend or family member. Finally, if you’re picking up a treat for a holiday gathering, check the labels! 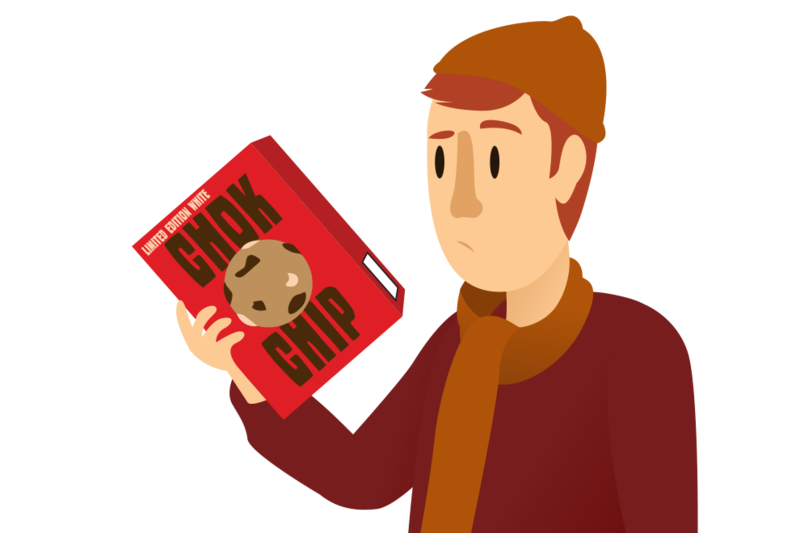 Use the Nutrition Facts to calculate serving size, nutrient content, and much more! Making a healthy plate will help you put your foods in the right proportions, too. Starting your day off with a balanced and high-fiber breakfast is a smart way to stay healthy this holiday season. After all, breakfast is associated with a lower BMI, fewer calories consumed during the day, and a better diet. Plus, a healthful breakfast not only gives you energy, but also increases cognitive function. Some ideas include high-fiber cereal with nonfat milk, and fruit, or lowfat yogurt and fruit, or egg whites and fruit. A smoothie made with fruit and skim milk is also a great start. How did you do? 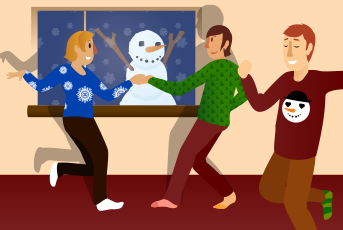 Do you know the nuts and bolts of staying healthy during the holidays? We’re all familiar with the benefits of building a healthful eating pattern, but sometimes actually executing on that plan is easier said than done. 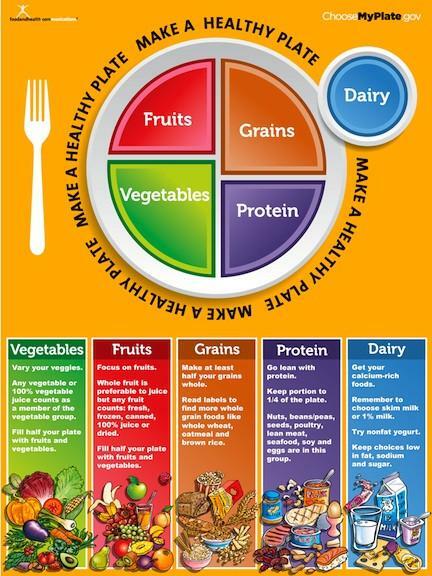 Make a healthful eating pattern more compelling with this fun game that kids and adults alike will enjoy! Everyone who is not a tagger is an empty serving. Each empty serving can work as a free agent. Their goal is to avoid the taggers. Explain that the taggers are seeking food groups to make a healthful plate. 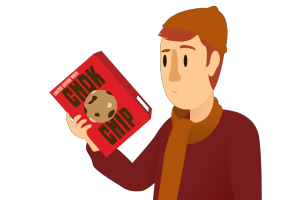 If an empty serving gets tagged, he or she must freeze in place and announce their new food group (determined by the tagger, who represents one of the 5 food groups), and then think of a healthful food that fits that group, which they then announce as well. The taggers must work together to create a balanced plate (so don’t let one tagger go crazy and tag all the empty servings, claiming them for a single food group). Set a timer for four minutes and move your group to a location that’s conducive to running around. Taggers must line up shoulder-to-shoulder. Arrange the empty servings five feet in front of the tagger line. Once “go” is called, the empty servings must evade the taggers for four minutes. Once the game time is finished, “stop” must be called. At that point, everyone freezes. Have the untagged empty servings move to one side of the game area, then arrange the tagged empty servings into their food groups. Did the taggers craft a balanced plate? Why or why not? If the taggers managed to create a balanced plate, then they win. If the empty servings threw off the balance, then they win instead. 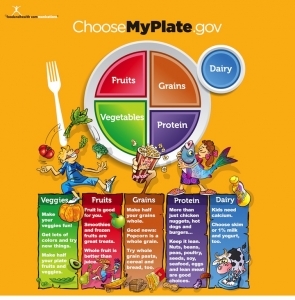 This active game offers a fun way to visualize a healthful eating pattern while providing an opportunity for some light physical activity as well. On Your Table: How Much to Work It Off Poster on a Tabletop Easel arranged behind some Balancing Diet and Exercise Handouts. If you’re doing the Are You Physically Active? Quiz, add those too. Brainstorming: How Can YOU Become More Physically Active? To set up your space, first arrange your table. Flanking it to one side, add the 10K Steps Banner and Stand. To balance it, set up your easel and brainstorming space on the other side of the table. 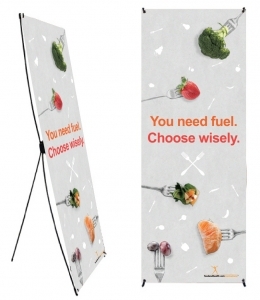 Top the table with the How Much to Work It Off Poster on a Tabletop Easel and fan some of the Balancing Diet and Exercise Handouts out in front of it. If you’re doing the Are You Physically Active? Quiz, arrange those on your table as well. Put your prizes (the 10K Steps Wristbands and 10K Steps Buttons) in an obvious spot at the front of your table, then take a step back and survey the scene. How does the display look? Make any necessary shifts, then get ready for your activities. For the Are You Physically Active? Quiz, distribute copies of the quiz handout to your participants. They can either take the quiz individually and quietly, marking their responses on the paper, or you can do a survey and walk everyone through each question together, having them call out or raise their hands with their answers. Help everyone score their quizzes and discuss the results. Are they physically active? What activities do they do that are best for their health? Why? Then turn the discussion over to the second activity: How Can YOU Become More Physically Active? Talk with the group. What is a typical day like? When are there opportunities to squeeze in a little exercise? Can people take a walk at lunch? Go for a jog after work? Swim after dinner? What would work within their lifestyle? Offer prizes to people who participate in the discussion, and record any notable answers in the brainstorming space that you have set up. If there’s time, talk about the stumbling blocks on the path to an active lifestyle. How can people overcome the obstacles that can get in their way? There are lots of other ways to help your audience get the exercise they need. Don’t miss these other wonderful resources that promote physical activity. And here’s a free printable exercise handout, just for you! It’s perfect for just about any display. And don’t miss these amazing 10k resources from the Nutrition Education Store! One of our longtime subscribers, Pat Hunter, MS, RD, is already thinking about summer. Just the other day she asked if we have any resources for healthy camping, and I was pleased to say that yes we do! Just in case anyone else would like them too, I want to send a few links your way. At the Food and Health Camping Database, you can see all the posts I’ve ever made about camping. 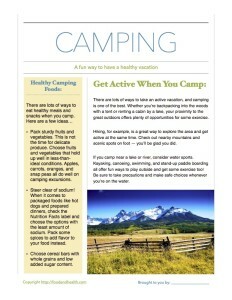 It includes a PDF handout, a guide to active vacations and even some fun camping snacks! Today, as a special treat, I’d like to unveil a brand-new camping handout, just for you! I’ve copied the text below, and if you like what you see, don’t miss the free printable handout at the bottom of the post. There are lots of ways to take an active vacation, and camping is one of the best. Whether you’re backpacking into the woods with a tent or renting a cabin by a lake, your proximity to the great outdoors offers plenty of opportunities for some exercise. Hiking, for example, is a great way to explore the area and get active at the same time. Check out nearby mountains and scenic spots on foot — you’ll be glad you did. If you camp near a lake or river, consider water sports. Kayaking, canoeing, swimming, and stand-up paddle boarding all offer fun ways to play outside and get some exercise too! Be sure to take precautions and make safe choices whenever you’re on the water. Pack sturdy fruits and vegetables. This is not the time for delicate produce. Choose fruits and vegetables that hold up well in less-than-ideal conditions. Apples, carrots, oranges, and snap peas all do well on camping excursions. Steer clear of sodium! When it comes to packaged foods like hot dogs and prepared dinners, check the Nutrition Facts label and choose the options with the least amount of sodium. Pack some spices to add flavor to your food instead. Choose cereal bars with whole grains and low added sugar content. Here’s a PDF edition of the handout. How will you use your copy? And here are some of the top vacation resources from the Nutrition Education Store! We all know that regular exercise is important for good health. We also know that it’s vital to find something you like or you won’t continue it. If you’re struggling with finding a program that works for you, needing to mix it up a little, or looking for a change, why not try my favorite activity? You may think that this is something just for older people (yikes!) but there are different programs and types of classes for all ages and fitness levels. 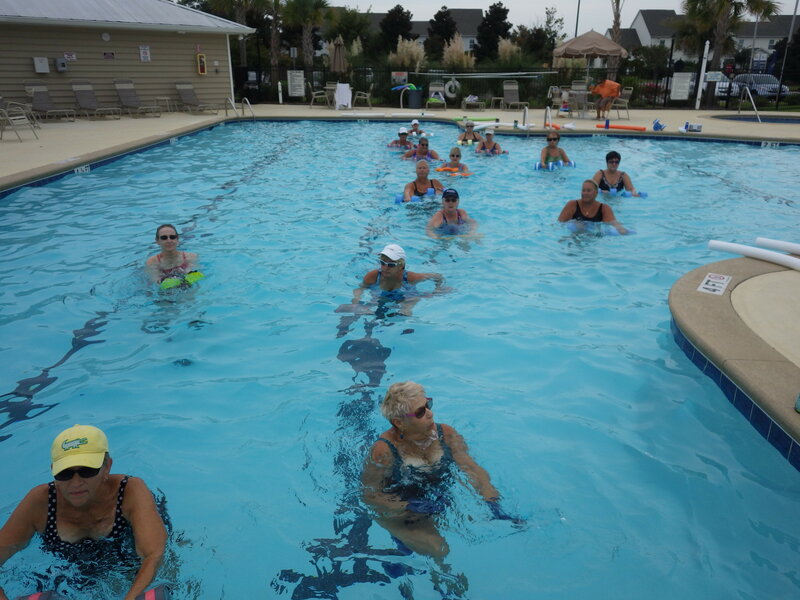 Water fitness (or water aerobics) programs and classes can help develop flexibility, muscular strength and endurance, and even deliver cardio-respiratory benefits. Other physical benefits include increased range of motion, improved balance and coordination, and a chance for some relaxation. 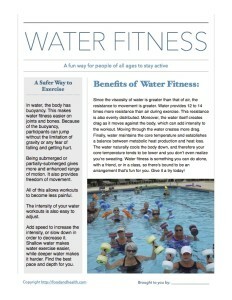 Exercising in water is different than land exercise. These differences create a great environment for a fitness program. Resistance. Since the viscosity of water is greater than that of air, the resistance to movement is greater. Water provides 12 to 14 times more resistance than air during exercise. This resistance is also evenly distributed. As an added bonus, water works the opposing muscles too. 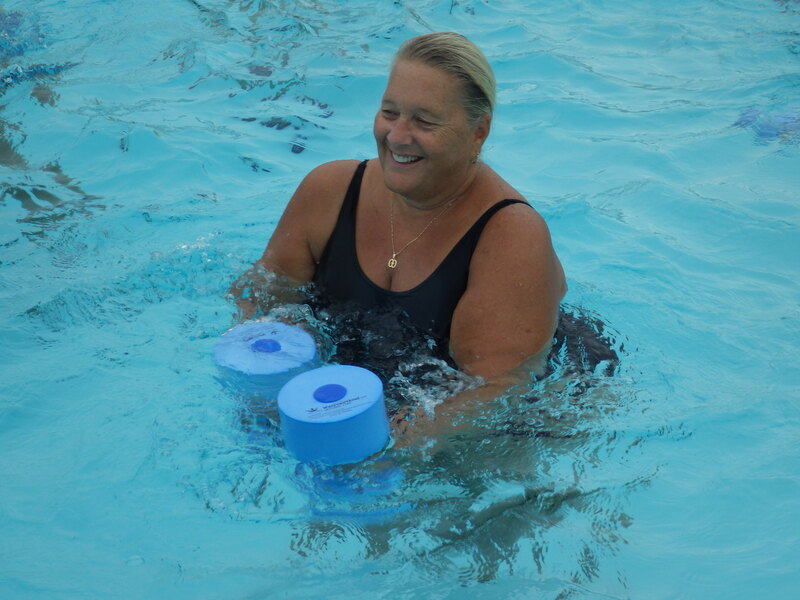 Kickboards, water weights (or hand buoys), or water noodles are often used to create additional resistance for strength building. Inertia. This is the force needed to move from a stopped position or to change direction. In water fitness, the inertia is against both the water and current. Once the momentum in one direction has been achieved, it takes additional energy to reverse the direction of motion. Body Surface Area. The water itself creates drag as it moves against the body, which can add intensity to the workout. Moving through the water creates more drag. Equipment such as webbed gloves and paddles increase these drag forces of the water, which can help build fitness. Thermal Regulation. Water maintains the core temperature and establishes a balance between metabolic heat production and heat loss. The water naturally cools the body down and therefore your core temperature tends to be lower and you don’t even realize you’re sweating. Intensity. The intensity of a workout can be increased or decreased with speed. Also, moving/traveling or working in deeper water increases intensity. Buoyancy. This is one of the major positive aspects of water fitness. In water, the body has buoyancy. 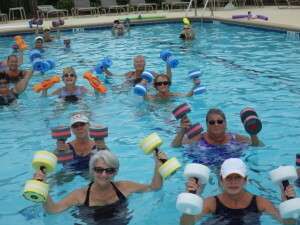 This makes water fitness easier on joints and bones. Because of the buoyancy, participants can jump without the limitation of gravity and the fear of falling and getting hurt. Being submerged or partially-submerged gives more and enhanced range of motions and freedom of movement. All of this allows workouts to become less painful. 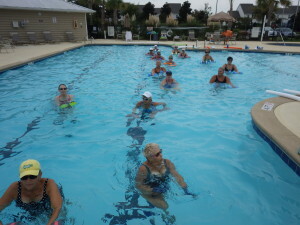 Water fitness is something you can do alone, with a friend, or in a class. On top of all these good things, the water can relax your body — enjoy that water massage! 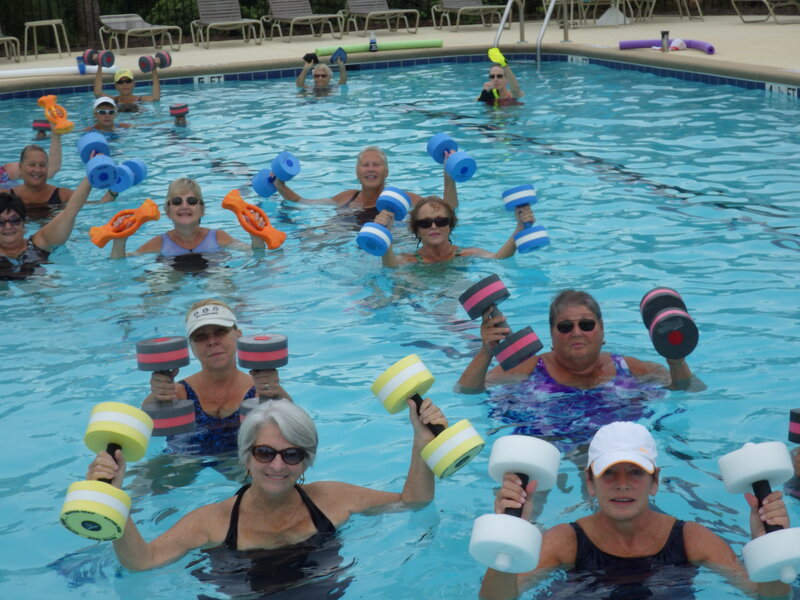 With water fitness, you’re sure to have fun! Here are more fitness resources, fresh from the Nutrition Education Store! And finally, last but not least, here’s a free PDF handout with great information from today’s post! 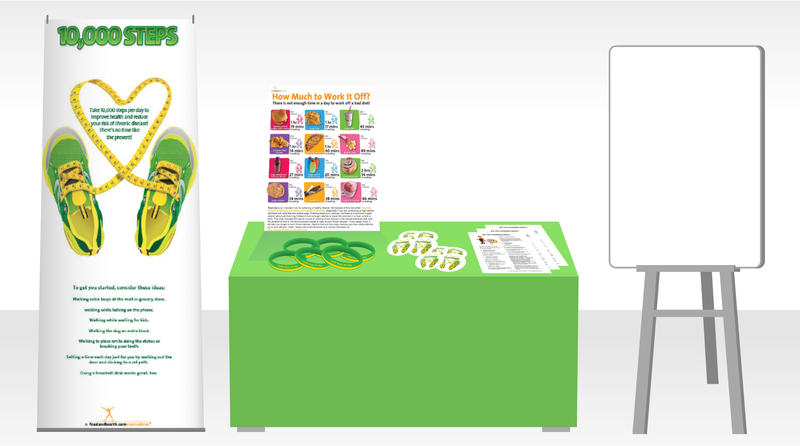 It’s time for another sneak peek inside the Nutrition Education Store! Today I want to talk about healthful eating habits. After all, there’s simply not enough time to work off a bad diet. 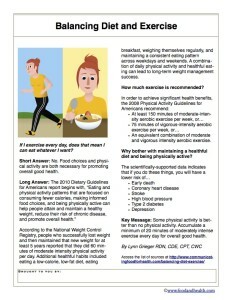 That’s why Beth Rosen, MS, RD, CDN and I teamed up to create this wonderful new poster, Work It Off. Work It Off outlines exactly how much time it would take a person to burn off the calories in common foods like burgers and soft drinks. Do your clients know that it would take 1 hour and 40 minutes to walk off the calories in half a frozen pizza? Or that an oversized cinnamon roll would take 2 hours and 14 minutes to walk off? Share all this painstakingly-researched information — and more! — with this fun and colorful poster. Of course, the fun doesn’t stop there! This poster comes with a free PDF handout. As a bonus just for you, I’d like to share that handout in its entirety, right now! Exercise is an important tool for achieving a healthy lifestyle. But beware of this diet pitfall: Exercise alone will not help you reach your weight loss goals, especially if you’re eating a high-calorie diet filled with solid fats and added sugar. Exercise does burn calories, but there is a common misperception about just how long it takes to burn enough calories to equal the calories in a meal, snack, or drink. 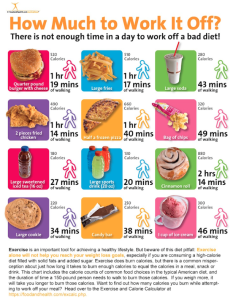 This chart includes the calorie counts of common food choices in the typical American diet, and the duration of time that a 150-pound person needs to walk in order to burn off those calories. How long will it take you to work it off? 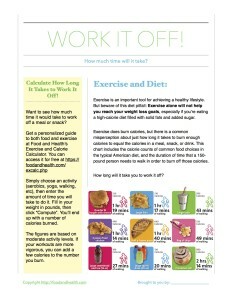 Get a personalized guide to both food and exercise at Food and Health’s Exercise and Calorie Calculator. You can access it for free at https://foodandhealth.com/excalc.php! Simply choose an activity (aerobics, yoga, walking, etc), then enter the amount of time you will take to do it. Fill in your weight in pounds, then click “Compute”. You’ll end up with a number of calories burned. The figures are based on moderate activity levels. If your workouts are more vigorous, you can add a few calories to the number you burn. Like what you see? Get the handout for free! Don’t wait until next week. The major rush of the Christmas holiday is over. It’s time to catch your breath and regroup for the new year. Even the most dedicated fitness people tend to get off schedule during the holidays. The pool where I do water aerobics does not have any classes scheduled the whole week. So what to do? It would be easy to just stay in and take the week off. Tempting…but probably not a good idea. I’ll definably have to make up for “lost time” the following week. While it might not be your regular workout, here are a couple ideas to keep you and the family active this holiday week. How about a new tradition on the weekend between Christmas and the new year—a family day at the beach, park or skiing. Take a Frisbee or ball and start a game. If you live in snowy areas make a snowman or snow angels. Clean the house—turn on some music and make it fun! Dusting, vacuuming and mopping is activity. Get up early—or if the kids or guests are sleeping in—-get a walk or workout in before they get up. Do something active first thing in the morning and then again after a meal…instead of heading straight for the couch. The fitness center or gym closed this week? Do a private class at home. Find a YouTube video. They’re free and come in all lengths and intensities. Try something different. Bookmark several of different lengths to fit into the time you have available. Did you or the kids get a Wii or Xbox as a holiday gift? Get it going and challenge your family. Take the dog out for a quick extra walk—that could be your “quiet time”. Don’t wait to next week….start the new year off with a healthier you.